This method of breathing helps heat up the body, strengthens the immune system, reduces inflammation, and shifts the brain from sympathetic dominance (fight or flight mode) into parasympathetic dominance, or relaxation. We all want to wake up in the morning feeling clear, joyful, and at ease. However, this probably doesn't come to us effortlessly every day. In fact, probably most times we wake up feeling the exact opposite: tired, stressed out, anxious, and worried about the future. There’s a very effective trick to help control the mind chatter and get us out of our habitual patterns and tendencies. It’s called the Wim Hof Breathing Technique. This method of breathing helps heat up the body, strengthens the immune system, reduces inflammation, and shifts the brain from sympathetic dominance (fight or flight mode) into parasympathetic dominance, or relaxation. Wim Hof, also known as The Iceman, is famous for having achieved some of the most remarkable feats of human endurance. He climbed Mount Everest at 22,500 feet wearing only shorts, ran a half marathon barefoot in the snow in Finland, and achieved countless other extreme physical challenges, all thanks to reining in the power of his mind through his breathing technique. The challenges he has been able to achieve teaches us that even when the body receives external stress from the environment, like freezing cold or high altitudes, the mind has the capacity to remain calm, confident, and steadfast. Regardless of what the cause for external stress may be—work, family, relationships, or hiking in the freezing cold with no clothes on—Wim Hof shows that by controlling the mind, one is able to stand free from paranoia and anxiousness. If you know how to control the breath, then you can train the mind and prepare your whole physiology to withstand any kind of extreme that comes your way. It doesn't mean we should all climb Mount Everest in shorts, but it does mean that it’s a proven fact that as human beings we have the capacity to use the breath to harness the power of our minds. Using this method helps bring us into a total, full-blown awareness to achieve anything we desire, without letting negative mind chatter dissuade us. When we are stressed, we go into shallow breathing and as a result, we put the body in an oxidative acidic state, making us more prone to disease. This acidic state causes deregulation in the chemistry of our physiology and our body and mind suffer from it. If we consciously bring more air into the body, there will be more oxygen available to go into the lymphatic system and change the pH of the body into a more alkaline state. Through conscious deep breathing, we are not only making the body more alkaline; we are changing the chemistry of our physiology by tapping into the autonomic nervous system to shift from sympathetic dominance into parasympathetic dominance. That is, we are able to access the reptilian brain, go deep into it, and activate it. Scientific studies and brain scans pertaining to Wim Hof have shown this shift in brain chemistry and prove this breathing technique actually works. Through deep rhythmic breathing, we can change the chemistry of our physiology and break the limits of our mind. 1. Make sure to do this breathing technique on an empty stomach, preferably in the morning before you head out the door. 2. 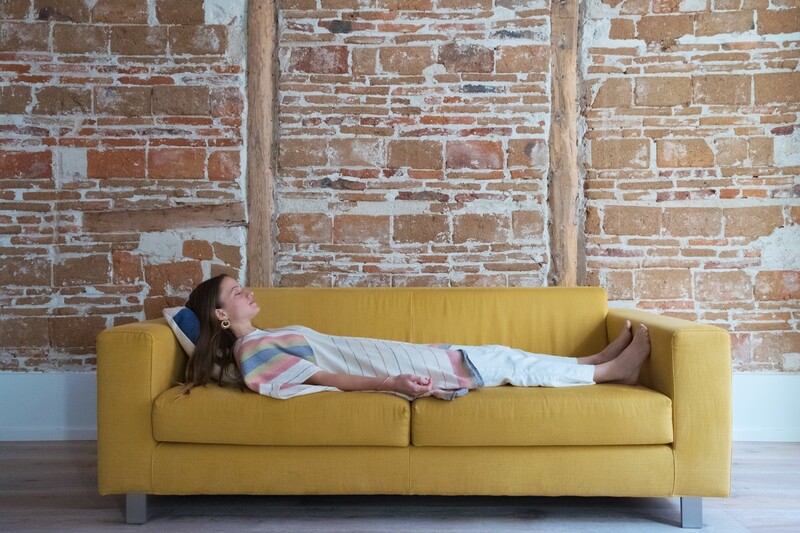 Do it laying down, on the sofa, on your bed, or on your yoga mat so that you can feel as relaxed as possible. This breathing technique is strong and you might feel lightheaded or have tingly sensations so it’s important that you’re not engaged in any kind of activity that requires your attention. 3. Do 3 rounds of 30 full deep breaths, preferably inhaling through the mouth since the mouth has a bigger opening than the nose. Move the breath upward, from the belly, up into the chest, and all the way up into the head, and then let it go. Allow your breathing to be rhythmic like waves coming in and out. Don't exhale completely, but rather focus on the inhalations. 4. After the 30th breath, exhale all the air out and hold the breath out for as long as you can. You can time yourself. 5. When you can't hold your breath any longer, take a full deep breath and hold the air IN for 10-15 seconds. Let the breath out. That's round 1. - Repeat this process two more times. - When you are done with round 3, remain laying down, or sit up for meditation. - Become aware of the stillness that remains, the spaciousness within, and the renewed clarity. - The last step is to set an intention. Make it simple, and let it be the driving force for the rest of your day. Notes: You might feel tingly and lightheaded. If you do, then breathe towards that sensation, and loosen the body. This only means that things are working! You might realize that your retentions will get longer and longer with every round. That is because your whole system has more oxygen, and so you don’t feel the urge to breathe in for a longer period of time. Like any other practice, it’s important to keep coming back to it over and over again, so that with practice, we are able to go past our normal conditioning and break through our own limitations.